The last time you went to a hospital, you probably had to fill out forms listing the medications you are taking and updating your emergency contacts. You also might have been asked a question about what is to be done with “excess tissues or specimens” that may be removed during diagnosis or treatment. Are you willing to donate these leftover bits of yourself (stripped of your name, of course) for medical research? If you are inclined to answer, “Sure, why not?” you will join the majority of Americans who would agree to donate, allowing your leftovers, such as blood or unused bits from biopsies or even embryos, to be sent to a “biobank” that collects specimens and related medical information from donors. But what, exactly, will be done with your donation? Can the biobank guarantee that information about your genetic destiny will not find its way to insurance companies or future employers? Could, for example, a pharmaceutical company use it to develop and patent a new drug that will be sold back to you at an exorbitant price? These questions may soon become a lot more real for many of us. Precision medicine, a promising new approach to treating and preventing disease, will require thousands, or even millions, of us to provide samples for genetic research. So how much privacy are we willing to give up in the name of cutting-edge science? And do we care about the kinds of research that will be done with our donations? 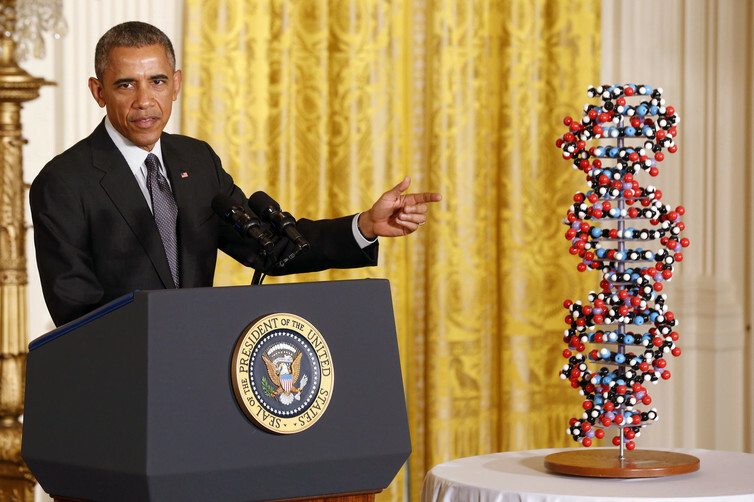 President Barack Obama makes remarks highlighting investments to improve health and treat disease through precision medicine on January 30, 2015. The PMI is now being implemented, and a critical part of the initiative is the creation of a “voluntary national research cohort” of one million people who will provide the “data” researchers need to make this big jump in medical care. And yes, those “data” will include blood, urine and information from your electronic health records, all of which will help scientists find the link between genes, illness and treatments. Recognizing that there may be some reluctance to donate, the drafters of the initiative bent over backwards to assure future donors that their privacy will be “rigorously protected.” But privacy is not the only thing donors are worrying about. Together with our colleagues at the Center for Bioethics and Social Sciences in Medicine at the University of Michigan and the Center for Ethics and Humanities in the Life Sciences at Michigan State University, we asked the American public about their willingness to donate blood and tissue to researchers. Data from our national survey – published in the Journal of the American Medical Association – reveal that while most Americans are willing to donate to biobanks, they have serious concerns about how we ask for their consent and about how their donations may be used in future research. What are you consenting to? You may think that some of these scenarios are far-fetched, but we consulted with a biobank researcher who reviewed all of our scenarios and confirmed that such research could be done with donations to biobanks, or associated data. And some scenarios are real. For instance, biobanked human embryos have been used to confirm how mifepristone, a drug which is used to induce miscarriages, works. Should we take these moral concerns about biobank research seriously? Yes, because progress in science and medicine depends on public trust in the research enterprise. If scientists violate that trust they risk losing public support – including funding – for their work. Witness the story of the Havasupai tribe of Arizona. Researchers collected DNA from members of the tribe in an effort to better understand their high rate of diabetes. That DNA was then used, without informing those who donated, for a study tracing the migration of Havasupai ancestors. The findings of that research undermined the tribal story of its origins. The result? The tribe banished all researchers. Rebecca Skloot’s best-seller, “The Immortal Life of Henrietta Lacks,” revealed the way tissues and blood taken for clinical uses can be used for purposes unknown to the donors. In the early 1950s, Ms. Lacks was unsuccessfully treated for cervical cancer. Researchers harvested her cells without her knowledge, and after her death they used these cells to develop the HeLa cell line. Because of their unique properties, Hela cells have become critical to medical research. They have been used to secure more than 17,000 patents, but neither she nor her family members were compensated. In a similar case, blood cells from the spleen of a man named John Moore, taken as part of his treatment for leukemia, were used to create a patented cell line for fighting infection. Moore sued for his share of the profits generated by the patent, but his suit was dismissed by local, state and federal courts. As a result of these and similar cases, nearly all biobank consent forms now include a clause indicating that donations might be used to develop commercial products and that the donor has no claim on the proceeds. Researchers can ill afford to undermine public trust in their work. In our sample we found that lack of trust in scientists and scientific research was the strongest predictor of unwillingness to donate to a biobank. Those who ask you to donate some of yourself must remember that it is important not only to protect your privacy but also to ensure that your decision to do good for others does not violate your sense of what is good. The “Proposed Privacy and Trust Principles” issued by the PMI in 2015 are a hopeful sign. They call for transparency about “how [participant] data will be used, accessed, and shared,” including “the types of studies for which the individual’s data may be used.” The PMI soon will be asking us to donate bits of ourselves, and if these principles are honored, they will go a long way toward building the trust that biobanks – and precision medicine – need to succeed. The Canadian Parliament is debating a bill regulating physician aid in dying. The deadline is early June 2016. On May 11, 2016, I testified before the Senate Committee on Legal and Constitutional Affairs, focusing on the policy aspects of psychiatric physician aid in dying. I was one of three witnesses in the session. Navigational guide: My testimony begins at approximately 16:38 with a personal statement. Most of the hour is taken up by a Dr. Derryk Smith, a psychiatrist from Dignity in Dying Canada. He is a forceful advocate of making available medically induced death to persons suffering from psychiatric disorders. I provide a counterbalance to some of the assertions made by Smith in a closing set of comments at 17:26. How worrisome is the ‘therapeutic misconception’? For those interested in the debate over the therapeutic misconception, Paul Appelbaum wrote a critical commentary of our recent paper in Journal of Medical Ethics. We published a response to his commentary here. It is not easy to find our response at the journal’s website so we hope the above links will help the reader in evaluating the exchange. The published exchange provides a glimpse into the very different ways in which people have approached this widely discussed phenomenon in research ethics. Author Scott KimPosted on May 18, 2016 May 18, 2016 Categories informed consent, therapeutic misconceptionLeave a comment on How worrisome is the ‘therapeutic misconception’? Since the publication of our study on 66 cases of psychiatric euthanasia or assisted suicide (EAS) in the Netherlands, I have heard comments from people that the issue is of minor consequence given how few cases there are. The relative numbers are indeed low. In the Netherlands in 2014, there were a total of about 5300 EAS cases, of which psychiatric cases were 41. Bracketing for now arguments about the importance of each individual life regardless of number, it may be useful to consider this issue from a purely quantitative standpoint. This will require some speculations about numbers but I will try to stay with what is known as much as possible, focusing on the U.S. Using per capita rates (rather than mortality rates) as a rough guide, there would be about 950 psychiatric EAS cases per year in the US using the current Dutch rates (US is 19x more populous; reporting rate in the Netherlands is about 80% or lower). For a large country like US, that is a small number but it does not seem inconsequential that nearly a 1000 persons per year would receive EAS for psychiatric reasons in the US. But the problem with dismissing psychiatric EAS based on current low numbers in the Netherlands is that it ignores three things: one, the tremendous potential for growth in numbers over the years; two, the large significance–quantitatively–of each false positive in terms of person-years lost; and three, the high likelihood of false positives given the broad and vague set of criteria for eligibility that are usually used (criteria which may be much less likely to be problematic in the terminal illness setting but extremely problematic to operationalize for psychiatric disorders–that is an issue for another discussion; here I focus on the numbers only). In the US, there are almost 43,000 completed suicides per year. For each completed suicide, there are about 25 suicide attempts. So there are about 1 million suicide attempts per year. Over 90% of completed suicides are in persons with some serious psychiatric disorder. Most people who request psychiatric EAS have attempted suicide in the past (often multiple times)–this does not directly help us in estimating how many people who attempt suicide might seek EAS, but we can make a rough, conservative assumption that about 1 in 10 persons who attempt suicide would attempt to make use of legalized EAS. I want to make clear that I do NOT mean that in fact there will immediately be that many people asking for EAS if it is legalized. Because both the medical culture (physicians feeling uncomfortable with the practice–as in the Netherlands where 2/3 of MDs cannot conceive of aiding in psychiatric EAS) and lay culture (only 28% of the Dutch public approve of psychiatric EAS even in the paradigmatic case of refractory depression) are opposed to psychiatric EAS, even legalization will not immediately lead to high numbers. But in a country with a broken mental health care system such as ours, we probably should not underestimate the potential for the system to flow toward the path of least resistance. Once the practice becomes established and accepted, there could be an increasing number of persons who apply, as is happening in Belgium and the Netherlands now. This number, even conservatively measured, could reach at least 100,000 persons per year in the U.S. based on above assumptions (i.e., 10% of all suicide attempts per year). In addition, there will be people who desire to die who would not have attempted suicide. This number is impossible to guess but if you speak with any experienced psychiatrist, suicidal ideation (without attempts) in persons with serious psychiatric conditions is common. I would imagine that given the large number of such patients, even if a tiny fraction sought EAS, the absolute numbers would be quite sizable. But to be conservative, we will ignore this group since it is very difficult to estimate. Thus, it is not unreasonable to assume that eventually the number of person who may ask for psychiatric EAS in the US, were it legalized, would over the years reach into six figures per year. Only a minority of such patients would likely meet criteria for EAS, even under a liberal regime. A longer discussion is necessary to argue this point but there are a variety of reasons to think this: many patients change their minds, some may not be competent to make decisions, and most commonly many will, with support and treatment over time, be able to cope better which may in turn lead to improvements in their symptoms. Still, a sizable minority might qualify for EAS. Suppose 20% would truly meet criteria, and 80% would not–assuming perfect application of eligibility criteria. request from the patient is voluntary and well considered. 4. There are no more reasonable alternatives for the patient. assistance with suicide with due medical care and attention. I have bolded the key substantive criteria having to do with competent decision-making, assessment of ‘unbearable suffering,’ and medical futility. In case you are wondering if these broad criteria are further specified or operationalized to guide the physicians, the answer is no. This is why there are disagreements in judgment. We can explore what would happen if physicians’ judgments are 90% sensitive (pick of 9 of 10 cases of truly eligible persons) and 90% specific (eliminate 9 of 10 persons who are truly not eligible) in identifying persons who are eligible for EAS. Based on my experience conducting capacity evaluations and conducting several studies on how physicians make capacity determinations, this is a fairly optimistic estimate of physician accuracy. Also, we already know that even in completed psychiatric EAS cases in the Netherlands, 90% reliability (i.e., agreement among physicians) is not achieved. Thus, the idea that the overall accuracy (sensitivity and specificity) can be 90% is probably too optimistic. Without reliability, we can’t have validity. But let’s press on. Under these assumptions, there will be about a 31% false positive rate. As applied to our sample of 100,000 requestors, there will be 26,000 persons found to be eligible by physician judgment. But of those, 8000 will be false positives and would be incorrectly provided with EAS. If we use instead a more realistic estimate of physician judgment accuracy–say, 80% for both, or even lower–we get the following results: if a physician says a request for psychiatric EAS meets all criteria, the chances that the person does not meet all criteria will be about 50%, i.e., a false positive rate of 50%. For our sample of 100,000 requestors, this will result in 32,000 persons being judged to be eligible, of whom 16,000 per year would not be in fact eligible (false positives). This would translate into about 320,000 person-years lost, using a conservative mean of 20 years lost per false positive. Not an insignificant public health impact. Waiving the requirement for informed consent? When is it permissible to waive or alter the usual rules of informed consent in human subjects research? It is a testament to the success of the modern system of regulating research with humans that such a question will seem odd, even disturbing, to many. Isn’t informed consent always necessary? Until recently, there has been relatively little discussion about how to apply these criteria. Perhaps this is because most of the time the waivers were used for medical records research which most people do not either know about or would agree to anyway. But with the increasing interest in comparative effectiveness research, there has been a steady rise in calls for allowing waivers in settings that have not usually seen such waivers, namely, randomized clinical trials. My colleague Frank Miller and I have been somewhat skeptical of this trend. We just published a new paper on this topic. In it, we use the principle of respect for persons as a way interpreting these criteria for waiver or alteration of informed consent. Author Scott KimPosted on February 2, 2016 February 3, 2016 Categories ethics of comparative effectiveness research, research ethicsLeave a comment on Waiving the requirement for informed consent? Back in 2008, Michigan voters were asked to approve the use of embryos in stem cell research. The names of the two opposing advocacy groups give a flavor for the strategic maneuvering by both sides: the opposition group called itself the Michigan Citizens Against Unrestricted Science & Experimentation and the pro-research group called itself CureMichigan. This is of course just one example of many we can name where those on opposite sides try to influence the debate by labeling it in their favor. (I am going to be lazy and not put quotes around the terms as I should in what follows). Pro-choice vs pro-life. Research participants vs research subjects. Patients vs clients (or, as in UK, service users). And of course physician assisted suicide vs physician aid in dying (among others, the latest being simply ‘hastening death‘). I’m trying very hard not to use the term _olitical _orrectness as that sets people off in different directions too. Two things are certain about these battles. One, at some meeting or other in which one of the above issues is being debated, someone will insist on a certain terminology because the opposing party’s term is ‘offensive.’ Two, once the discussion about terminology starts, there is rarely a resolution, only occasional cowed acquiescence and more often many rolling of the eyes. (I must admit I have done my share of eye rolling. I can happily report, however, that in my experience the tendency to eye roll seems to be one of temperament rather than ideology, as people on all sides seem to engage in it). Terms used in bioethics discussions and debates are often, or even usually, not neutral. Not all people, even on the same side of the debate, insist on terminological correctness. This is true in assisted death debates in some places where, for example, in Belgium and Netherlands, assisted suicide and euthanasia are terms built into the laws. In contrast, US laws permitting the practice usually reject the term assisted suicide. The following premise may or may not be acceptable to all. 3. An ethical issue should be something that should be resolved through, well…, reason, and not simply by asserting and manipulating power and influence. The final terminology should be the result of a reasoned debate, not a means to wield power. To insist on a universal use of one’s own preferred term while the debate is in progress therefore seems unreasonable (if you accept 3) since it is asking one’s opponent to adopt a position that is still being debated. In fact, it is unclear, if you accept 3, that insisting on neutral (people who have not taken sides yet) parties using the preferred terms is a reasonable request either. But doesn’t this ‘privilege’ the status quo position? Not necessarily. The most fair conclusion, it seems to me, is that we should respect the use of terms of each side’s own choosing, to the same extent that we should respect each side’s attempts to explain and persuade. To insist that the other side, or even neutral parties, start using one’s own preferred term is to put the conclusion ahead of the premise. Or as logicians put it, it is begging the question. Academic journals should refrain from imposing on authors a specific terminology in an ongoing debate. It would be an unnecessary ideological intrusion to insist on a particular terminology while the debate is in progress. For example, editors should not insist on either “research subject” or “research participant”–they should let the authors choose. It does not help to say that the other side’s terms are ‘offensive.’ This assertion is true only if the other side is wrong. But that is precisely what is being debated. Practically speaking, such a claim should be supported by an argument rather than simply insisted on; otherwise, it is a form of intellectual bullying. Academics’ opinions and views are regarded with special weight because they are seen as objective arbiters (at least to some degree). The duty to refrain from trying to win a debate by insisting on a more friendly terminology is therefore especially pertinent for academics.